“Forex” stands for foreign exchange and refers to the buying or selling of one currency in exchange for another. It’s the most heavily traded market in the world because people, businesses, and countries all participate in it. When you go on a trip and convert your US dollars for euros, you’re participating in the global foreign exchange market. At any time, the demand for a certain currency will either push it up or down in value relative to other currencies. With this in mind, here are some things you need to know about the currency market so that you can take the next step and start forex trading. The Forex market uses symbols to designate specific currency pairs. The euro is symbolized by EUR, the US dollar is USD, and so the euro/U.S. dollar pair is shown as EUR/USD. Other commonly-traded currency symbols: Australian dollar=AUD, British pound=GBP, Swiss franc=CHF, Canadian dollar=CAD, New Zealand dollar=NZD, and Japanese yen=JPY. Each forex pair, EUR/USD, AUD/USD, or USD/JPY for example, will have a market price associated with it. The price refers to how much of the second currency it takes to buy one unit of the first currency. If the price of the EUR/USD currency pair is 1.3635, this means that it costs 1.3635 US dollars to buy one euro. Learning forex trading involves getting to know a small amount of new terminology that describes the price of currency pairs. Once you understand it and how to calculate your trade profit, you’re one step closer to your first currency trade. Many currency pairs will move about 50 to 100 pips (sometimes more or less depending on overall market conditions) a day. A pip (an acronym for Point in Percentage) is the name used to indicate the fourth decimal place in a currency pair, or the second decimal place when JPY is in the pair. When the price of the EUR/USD moves from 1.3600 to 1.3650, that’s a 50 pip move; if you bought the pair at 1.3600 and sold it at 1.3650 you’d make a 50-pip profit. How much each pip is worth is called the “pip value.” For any pair where the USD is listed second in the currency pair, the above-mentioned pip values apply. If the USD is listed first, the pip value may be slightly different. To find the pip value of the USD/CHF for example, divide the normal pip value (mentioned above) by the current USD/CHF exchange rate. For example, a micro lot is worth $0.10/0.9435 = $0.1060, where 0.9435 is the current price of the pair, and subject to change. For JPY pairs (USD/JPY), go through this same process, but then multiply by 100. For a more detailed explanation, see Calculating Pip Value for Different Forex Pairs and Account Currencies. Understanding the above concepts will help you grasp what’s happening when you see a forex pair rising or falling on a chart. If you do the math on the difference in pips between two price points, it will also help you see the profit potential available from such moves. For more on starting out in forex trading, see Minimum Capital Required to Start Day Trading Forex and How Much Money Can I Make Forex Day Trading? 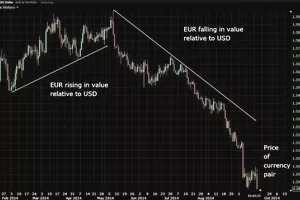 Both these articles provide more examples of how profit is realized in the forex market, as well as introducing new concepts, such as leverage.